Another great Weight Watchers Crock Pot Recipe that is super easy, delicious and just 5 Points per serving. This Crock Pot Chicken Teriyaki Recipe was a hit with the whole family. I ate mine as is to avoid adding extra Points, but I served my families over some rice, and they LOVED it. 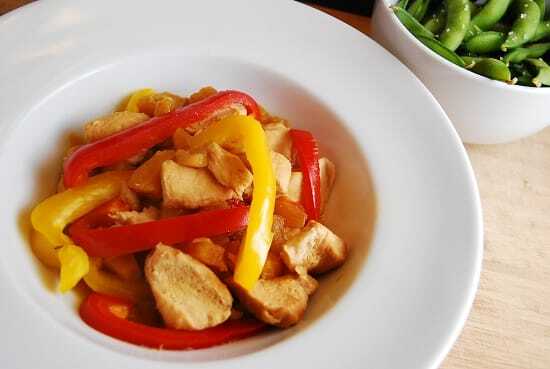 The pineapple and bell pepper are a great way to add a bit more flavor to the chicken, and to get in those fruit and vegetable servings. Also, this low calorie crock pot recipe can be done with frozen chicken too…but it may closer to 8 hours cook time instead. Next time I make this, I think I’ll add in some fresh sugar snap peas too….yum! Enjoy. Get your teriyaki craving satisfied the healthy way with this easy and delicious Weight Watchers Crock Pot Recipe. Works great served over rice or noodles for extra Points! This dish is definitely a crowd pleaser – plus it’s loaded with vitamins and minerals from the fresh pineapple and veggies. Combine soy sauce, garlic, black pepper, and brown sugar in a small bowl. Stir until combined. Place chicken in bottom of slow cooker, cover with pineapples and top with sauce. During last hour of cooking, add in bell pepper slices. To thicken sauce, also remove lid from slow cooker in the last hour of cooking. If you prefer a thicker sauce, transfer sauce to pan and boil with flour or cornstarch until reduced to desired thickness. When I put this in my Points Plus recipe builder, it came out as 7 PP. Should I not be adding the pineapple and veggies to the recipe builder? The Weight Watchers Recipe Builder is not very accurate…it calculates Points based on an average of nutritional data that has been entered for that type of ingredient. When I calculate the Points Plus for my recipes, I manually add up the nutritional stats for all ingredients and divide it by the number of servings. The only way to get the most accurate Points value is to do the same with the specific brand of ingredients you use. made this last night! AMAZING! my hubby loved it and told me I HAVE to make it again! Guess I did something wrong. My hubby and I ate this meal tonight and it was terrible! Chicken was very dry and tasted burnt! I’ve never burned meat in a crockpot. It was really bad.